A recent foray into DIY composite parts has led me to the doorstep of Applied Vehicle Technology. 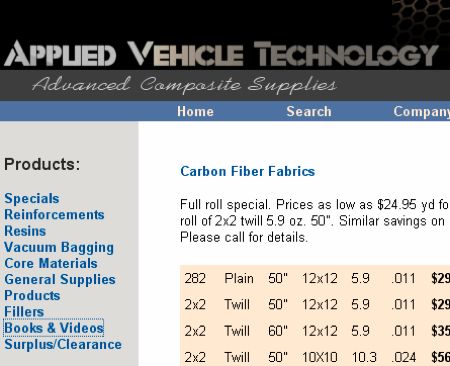 They retail everything you need for at-home carbon fiber lay-up, including the fabric itself, various resins, vacuum-bagging materials, and of course, tools, all at very good prices. Thanks to interest from the industrial sector, carbon fiber keeps getting cheaper, inching closer and closer to becoming commonplace. Surprisingly few people know how to work with the material, and only a few more are even interested, which is a shame. Simple forms can be made with insulation foam, a bottle of acetone, resin, carbon fabric, and a steel roller. That’s it. It’s much cheaper to equip yourself for very high-quality carbon fiber work than for, say, machining. Invest about $300, and you’ll have a slick little vacuum-bag setup and enough fabric for all kinds of projects. Invest less, and you’ll still get what you need to add another skill to your repertoire. The problem I had when I did a cursory look into making stuff with carbon fiber at home was that while it seems incredibly easy to use (it’s paper mache basically), it makes a nasty mess and it doesn’t seem to have a progressive failure; it either works or fails spectacularly, which goes back to the nasty mess issue, and there isn’t really an easy way to tel if it’s about to fail. Perhaps I’m over thinking the issues with the splinters and what not, and I’ll probably pick some up anyhow and start playing with it, but many questions I still have. which basically says the same thing — catastrophic failure is bad in a lot of applications. Handle carbon fiber like you would fiberglass, taking care to heed all the eye, lung, and skin embedding cautions that go with fiberglass. Anyone know of a good book or website to learn about the “nuts and bolts” of working with carbon fiber? Try Fiber Glast’s Learning Center. They have plenty of videos and other media to get you started. I am building a carbon fiber trike (petal powered) and found another site with great pricing. I ordered my materials from solarcomposites.com.